With amazing performances and fundraising, this year’s Greek Sing thoroughly entertained and raised money for a great cause. Kappa Alpha Theta took home the trophy, but most importantly, ticket sales from the event raised over $18,000 for St. Jude Children’s Research Hospital. First up, Phi Kappa Tau stole the show with their “The Greatest Showman” themed performance. Along with giving a great performance, Phi Tau raised the most money in donations for the night. Next, Alpha Sigma Tau changed the channel and took the audience through ASTv. Dancing and singing to themed segments from various television shows, a highlights being their rendition of “Billionaire” during the “Keeping Up with the Kardashians” portion of the performance. The next sorority to take the stage, Phi Mu, brought the audience into a madhouse and attempted to get revenge after losing last year. Some highlights from the performance were tumbling tricks and a jump roping portion that wowed the crowd. Although Phi Mu just missed out on winning the trophy for Greek Sing — taking second place — they took home the Chapter of Excellence award for 2017. During the brief intermission between performances, a representative from St. Jude came out to remind everyone of the true purpose of Greek Sing. She brought out the Miller family whose son Ian is a St. Jude patient. “Everything they did to help Ian has gone on to help another kid,” said Courtney Miller, Ian’s mom. Greek life representatives presented St. Jude with a check for $18,220 from ticket sales and announced that people could still donate by putting money into donation jars to vote for their favorite performances. After the break, Alpha Gamma Delta went on a mission through the galaxy to capture its president. Dancing and singing to a number of space-themed songs, they entertained the audience and gave a strong performance. The evening also featured special performances from the 629 Dance Team and Delta Sigma Theta. In the end, Kappa Alpha Theta delivered the most show-stopping performance of the night. 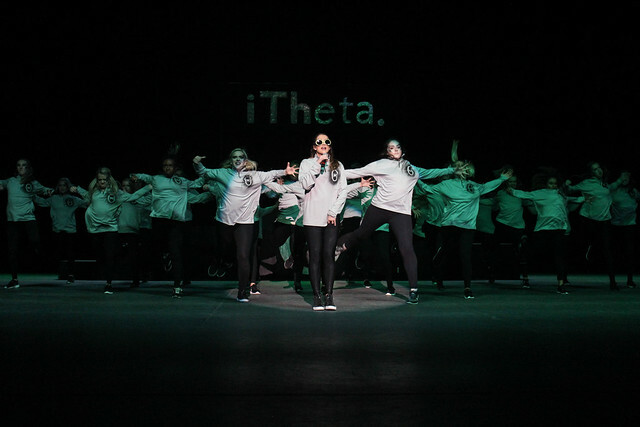 The theme, iTheta, took the audience through Theta’s mission to save Greek Sing. A big highlight of the performance was a rendition of “It’s Raining Men,” dedicated to Phi Tau. Using creative choreography involving umbrellas and tumbling, this portion of the performance made the crowd erupt into applause. This story written by Caroline Cathey. Photos by Shelby Thacker.